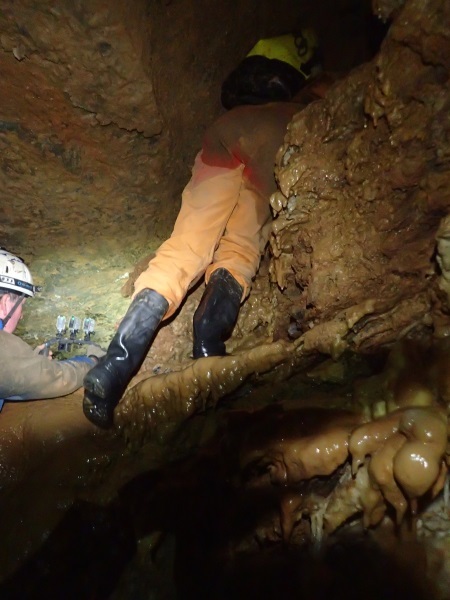 Caving – Mole Creek – Tailender … finally! 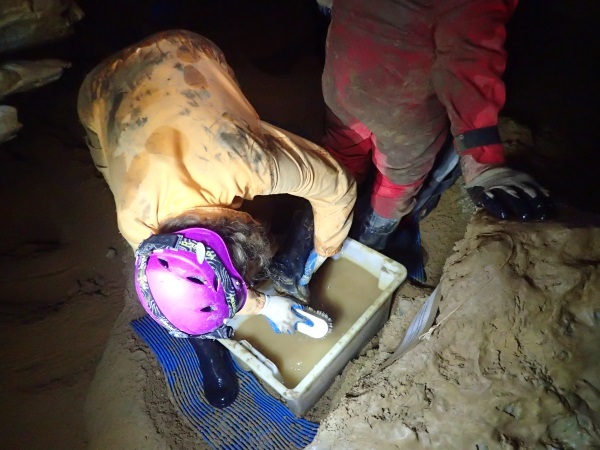 If you’ve been wondering where the blog post was for the caving I did at Mole Creek, well, I had a blog disaster. My camera battery ran out of juice just when I got to the end of the cave, where the piece de resistance formation was. And my spare battery was way back in the cave in my backpack! 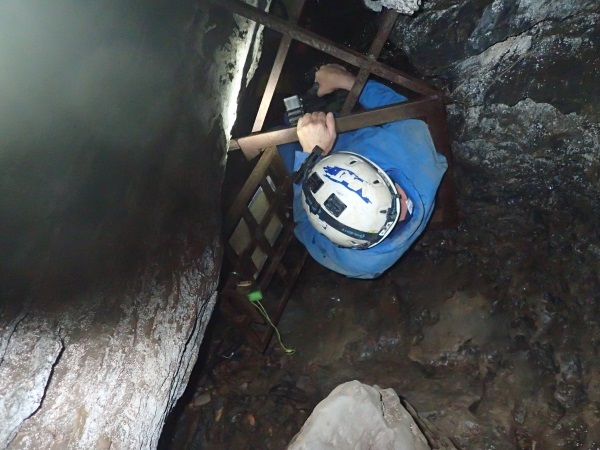 Never mind though a caving friend has rescued me so I have a shot of it! 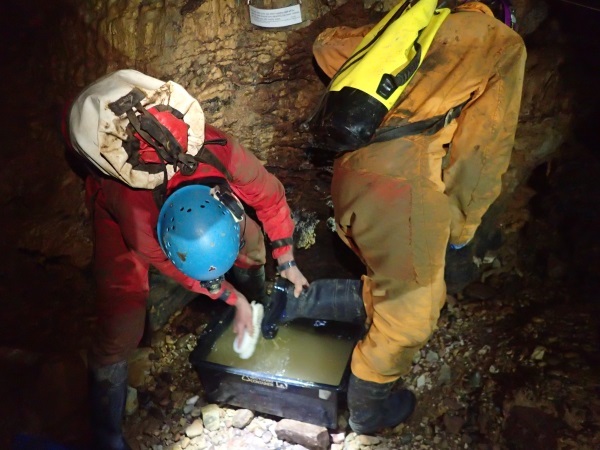 Anna O-B and I arrived at Mole Creek after our Mt Cripps adventure and joined the rest of the MSS cavers. 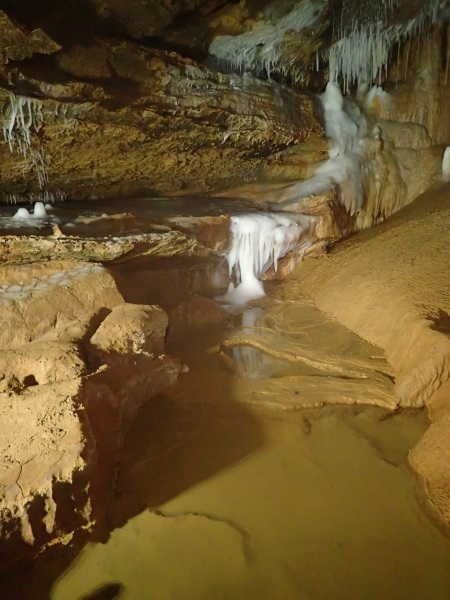 I had booked in for Croesus and Lynds caves, both of which I’ve done before – they are both classic caves, lots of formations and nice steam-ways, you can see pics of Lynds here and Croesus here from the trip I’d done back in April 2018. The gathering of cavers at the Mole Creek Pub was a real social event, lots of beer and wine and great food. 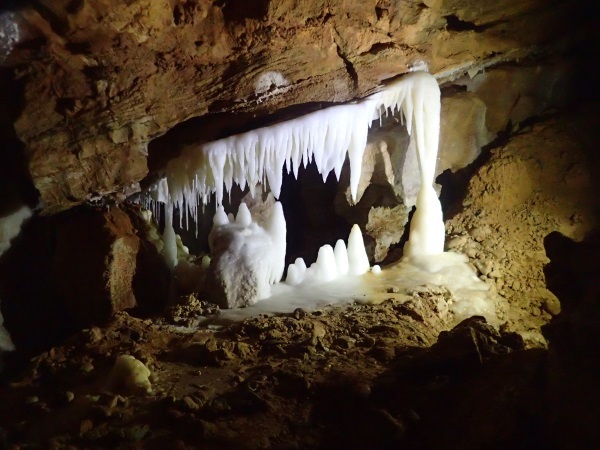 On the April 2018 trip to Mole Creek, I’d missed out on Tailender so it was the one cave that I really, really, really wanted to do, and it didn’t disappoint. We were a small group on the Thursday, our leader Steve J, backed up by Bob K, Carey, Alan G and me. 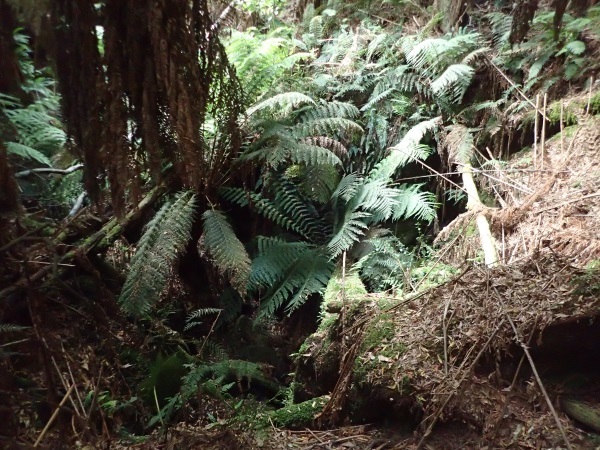 The walk in was a piece of cake (all on a track) until we got to the entry, covered in tree ferns, you wouldn’t know it was there unless you were told. The locked gate was challenging to get past, a feet first affair – always a mystery what’s below you. Followed shortly thereafter by a rift, not too long but awkward walking sideways. The rift was followed by quite a lot of boulders, and then the “floppy disk” I think they called it, a big flat rock with a “letter box” opening that you had to squeeze through, I went under this, but on the way back I went over (it was fun). Crawling on hands and knees. And lots of Boot Washing stations. And another one, you can see how they’re needed. We had to walk through this pool, even though we’d just washed out boots, somehow it just seemed wrong. The walk through the pool was followed by a climb up, again, seemed wrong crawling all over formations. Not sure where this was, but it was interesting, mud, that had dried out into a tessellated sheet and then either salt or calcite deposits on the tope. 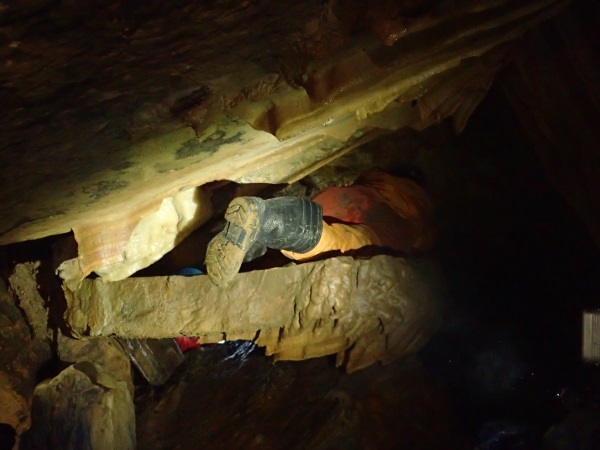 There was quite a bit of this in the cave. And then we walked a little further along and came to what we thought was the end, lovely formations all over the place and pools of water. Delicate formations on the roof. And a nice set of sharks teeth. There were lots of this delicate “straw” looking stuff. But nowhere could we see what the cave is famous for. 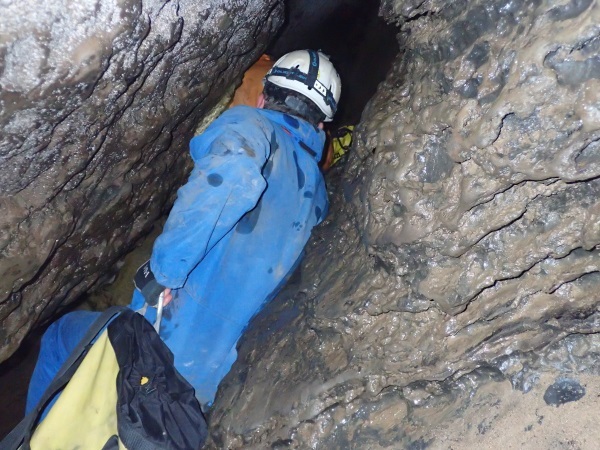 Steve hadn’t been in the cave before so he was stumped. The formations are iconic, where could they be. I felt as though I’d been short-changed. Eventually Steve said he’d take a look around and then we heard the call “you’d better come up here”, and so, we went up a passage that extended for another 30m and there they were! And it was at this point that my battery in my camera failed (doh)! 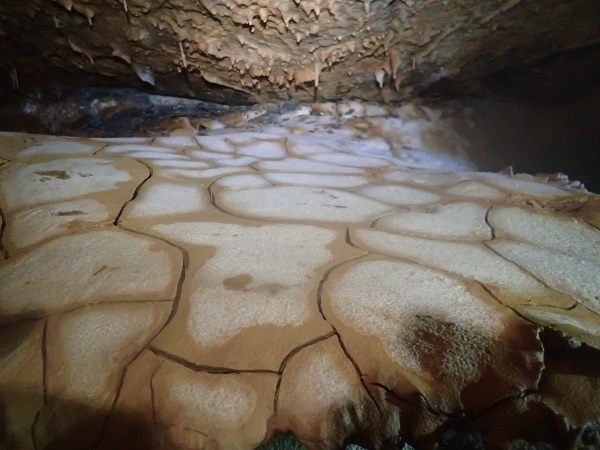 Formations that came down from the ceiling and then stopped at the water and formed what I can only describe as upturned umbrellas, like a saucer of calcite just floating on the water. Fascinating (photo Alan Green). A closer look at them. 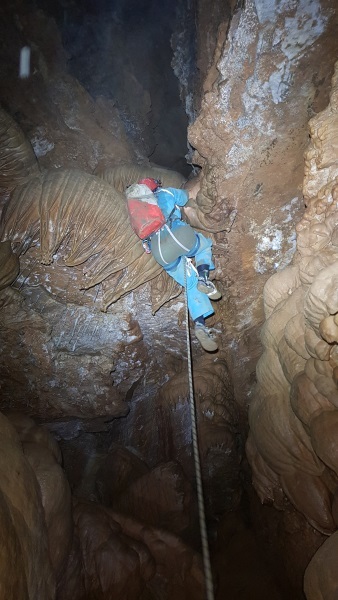 I’ve never seen them in any other cave, am sure that these can’t be the only ones that anyone’s ever seen, but it was a real thrill to see them up close. (Photo: Alan Green). Lots of photos were taken but they really can’t do them justice! All that remained now was for us to retrace our steps, abseil down and find out way out. It felt like a much shorter/quicker exit than going in. 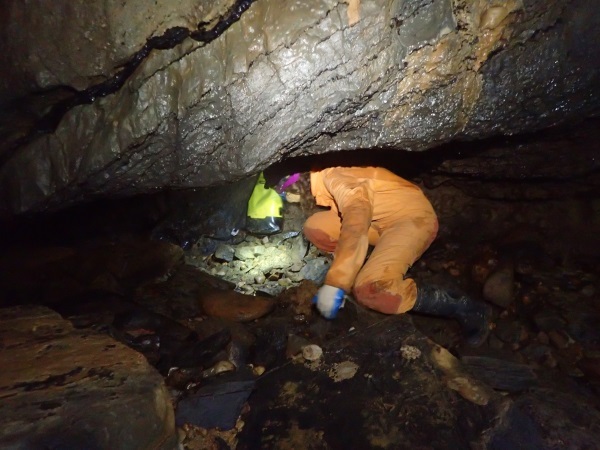 I’d definitely like to return to this cave again, stunning. Thanks Steve (and the rest of the crew) for taking me to Tailender. 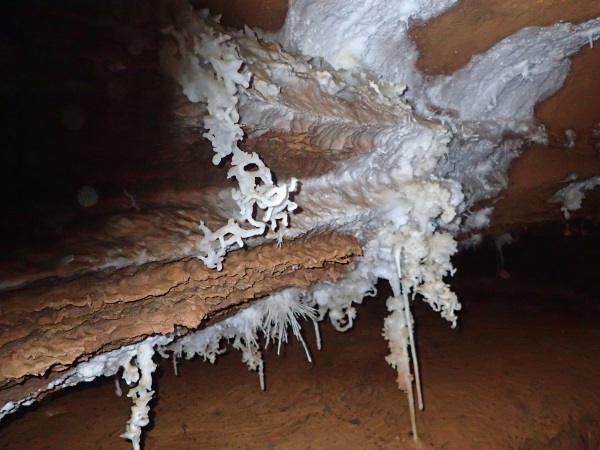 This entry was posted in Caving, MSS, Tasmania. Bookmark the permalink. 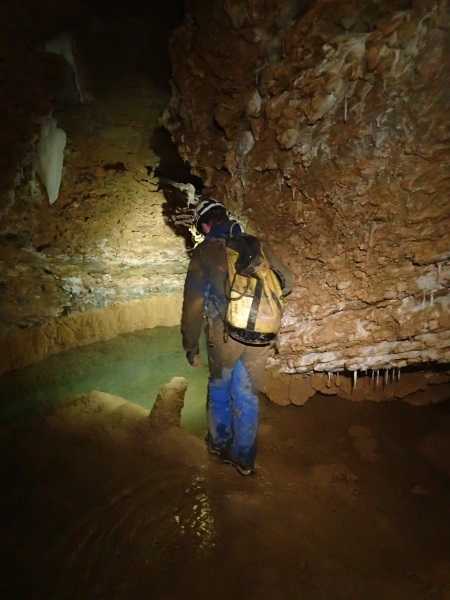 4 Responses to Caving – Mole Creek – Tailender … finally! Good one! I may even be tempted to return to this cave. I just recall lots of crawling in the entrance series. That’s funny, I don’t remember that much crawling, mind you almost 3 months has gone by. 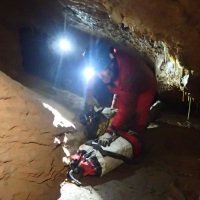 I’m keen to go back, am sure there are other caves there to do AND I really want to do Midnight Hole! WOW, WOW, WOW! Those photos are amazing! I can see why you were so disappointed your camera battery ran out! Yes, am always having trouble with my batteries these days OR leaving the camera in the car, you’d think I’d be more organised wouldn’t you!